Uses our EZ TIE HANDLED BAGS. Nearly indestructible dispenser for our EZ Handled bags - made from 100% post consumer/industrial waste LDPE plastic. 1000 bag capacity - 10 blocks of 100 EZ Tie Handled bags. 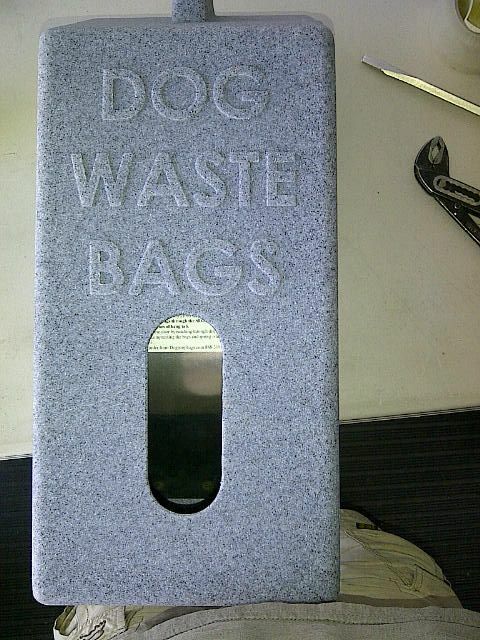 Available in 4 colors - high visibility orange (great for dog parks) and granite gray, sandstone (tan), and forest green. Custom colors are available with a minimum order of 25 dispensers for an additional $5 per dispenser. Measures 20 inches tall, 9.5 inches wide and 7.5 inches deep. 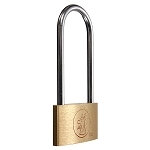 Dispenser is secured by a weather resistant solid brass padlock. All your dispensers will be keyed alike and come with 3 keys per dispenser. This dispenser is a great option where durability and high capacity are needed. 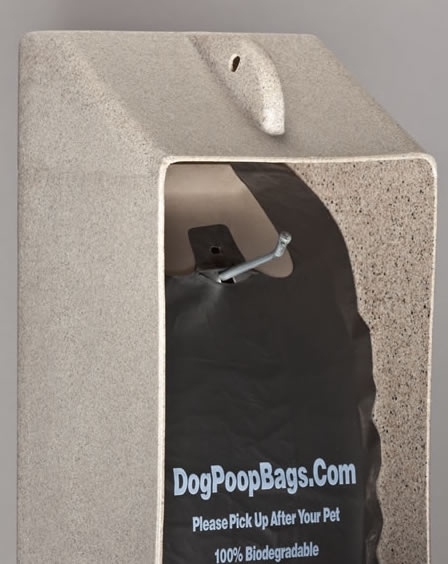 Holds 2.5 times more bags than other manufacturers dispensers - which means fewer refills for your staff and fewer outages for your dog walkers. Dispenser design MAKES IT DIFFICULT TO TAKE MORE THAN ONE BAG AT A TIME since the bags are not on a roll - saving you money on bag costs. Can be mounted on metal or wood posts, building or other solid objects. The dispenser comes pre-drilled for mounting. Because every mounting situation is different - we do not include hardware. Inexpensive mounting hardware - bolts or screws - are available at any hardware store. Volume discounts are shown - call for further quantity discounts and incentives if you are ordering more dispensers than listed. BE SURE TO ORDER WITH OUR HANDLED BAGS - NOT ROLLED BAGS. Our chrome hanger is NOT needed with this dispenser. NOTICE: We will not sell dispensers without your intention to purchase our EZ Tie bags. Using other bags in our dispenser may put your users at risk.